Every time I try to write in my sons' baby books, I get stuck on the page with the family tree. 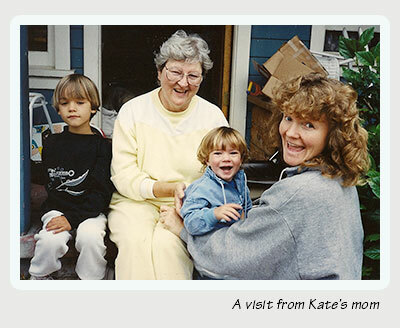 It presents such precise, unflexible categories: Mother, Father, Grandmother, Grandfather. I can't even begin to mold our family's makeup into such a shape. 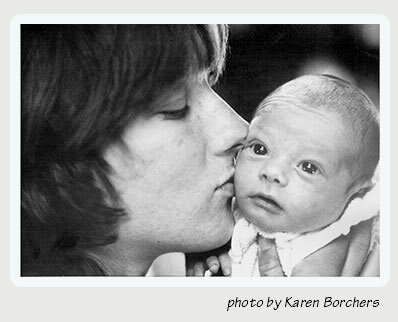 I started with myself and Kate, our sons' primary parents. 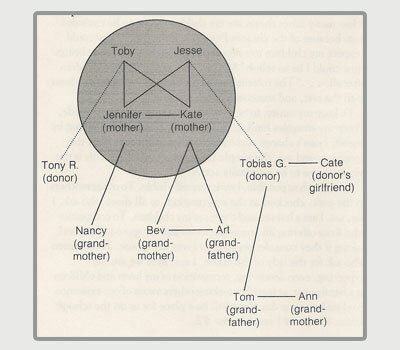 Then Toby's donor, and Jesse's donor, and Jesse's donor's girlfriend (who has been involved since the beginning). 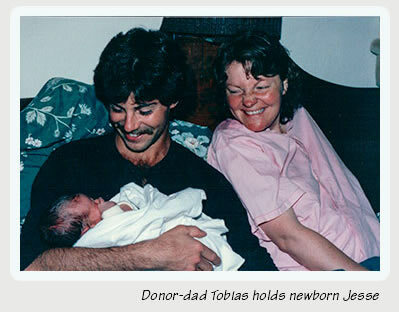 There's my mother, and Kate's mother, and Tobias' (Jesse's donor) father and stepmother (who are involved actively as grandparents). But what about all of the boys' "aunties" — our friends who have special relationships with the kids? And the kids' godparents? 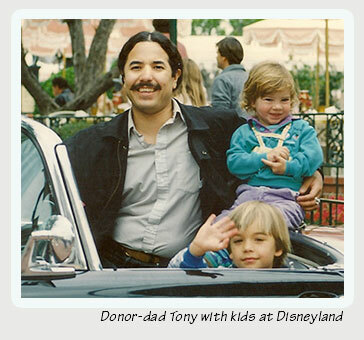 What about our friends who used the same donor as we used for our first son? Technically, their son is related to ours. And what about Judith and her kids, with whom we spend every holiday and share every important event? As I attempted to add everyone I considered part of my "family" to our family tree, the page became a web of criss-crossed lines. In these days of blended families, I don't think we're so unique with all our interconnections. In fact, in many ways, I feel we are very ordinary. We live in a nice but modest house on a quiet street. There's a swingset and a golden retriever in the backyard, and the front yard's full of tricycles. I work and Kate stays home with the kids. All we're missing is the picket fence. 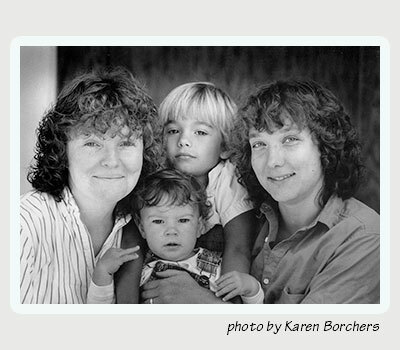 Our more radical friends might say we've bought into the middle-class nuclear family model. But every day, I'm reminded of our difference. Even the most innocent questions in line at the supermarket can put me on the spot. "Your baby's hair is beautiful. Is your husband dark?" "Are you still nursing him?" "Did you give birth to him at home?" When my first son was born, I promised myself that I would never be ashamed of who we are as a family. That I would counter the shame that society would try to force on us with a fierce pride. I wanted that pride to seep into my son's veins and nourish him, strengthen him for the battles he would inevitably have to fight. When my son was three, he reminded me of that promise with his own openess. While traveling, we'd stopped for lunch in a small town in Washington state — not one I felt particularly at home in. When the waitress approached our booth, Toby stood up in his seat and announced, "My name is Toby and these are my two moms: Mama J and Mama Kate." Kate and I both shrank two inches in our seats and acquired an immediate fascination with our menus. "Maybe she didn't hear him," I thought as the waitress smiled benevolently at him. 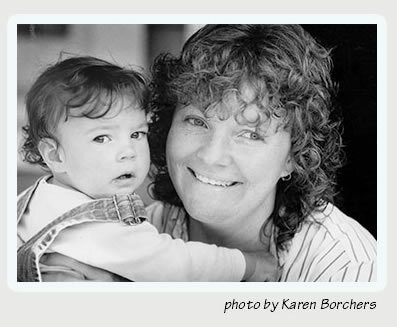 When I recovered, I looked again at Toby's face — beaming with self-confidence. And I realized that I had betrayed him. I had taught him to love who we were without teaching myself. And I vowed again to never hide. Luckily, we live in a place where that is possible. Santa Cruz is relatively open and accepting — not exactly Utopia, but not the Bible Belt, either. We don't have to hide from anybody. The children's pediatrician can never remember which of us gave birth to which child, but has always been very respectful of our situation. Toby's teachers are careful to say "parents" instead of "mom and dad" and to recognize all kinds of family units when discussing families. And the kids in Toby's class think Toby is incredibly lucky and special to have two moms. I'm grateful to live in such a place and don't think I'd be willing to live anywhere else where oppression is more overt. Yet the little daily dilemmas are trying. Even though I've promised myself to never lie about our situation, there's always the question of how much to say, what to imply, and what to leave alone. If the waitress asks which of us is Toby's mom, what do we say? What's more harmful to Toby — watching the waitress' possibly negative reaction if we say, "We both are," or having his relationship with Kate denied? It's never easy, but I have developed a kind of "technique" for dealing with inquiring strangers like this. I answer directly and truthfully with a confidence that leaves no room for further questions or raised eyebrows. Then I withdraw, either by leaving or by ending the conversion. By the time what I've said has sunk in, I'm usually out of sight. Whatever their reaction might be, they can deal with it alone. Whether it's shock or curiosity, I'm not interested in it. The hardest thing about being an alternative family is that society has no place for us. There's no checkbox for us when I fill out forms: Married? Single? Divorced? Separated? And on the forms for the children, one of us has to put our name in the Father slot. When we were looking for a house to rent, it took almost a year because, even though I had an excellent job, we were viewed as an unwed mother and an unemployed student. And we were denied student housing because we weren't married (even though we were told heterosexuals didn't need to show a marriage license). We can't get family insurance or file joint taxes, and we can't even be legal guardians of each other's children. Because we don't fit into any of society's pigeonholes, we simply do not exist. These are not issues I look at every day, and yet I live with them. They sit like rotten fruit in the back of the refrigerator. Even on the best day, when our donor's parents have come for a visit bearing presents for the children and I feel blessed for the family we've created, I still live with the knowledge that these people who visit two or three times a year have more legal right to my baby than I do. "Don't you have contracts and wills and things?" a friend asked me incredulously when I mentioned this. It doesn't matter. They can all be contested. Donor contracts have never been tested in the courts. And since Kate and I can't adopt each other's birth children without giving up custody ourselves, if something happened to one of us, the other would have to fight for custody. Our children's destiny would depend on the personal biases and opinions of the judge in court that day. Thinking about the obstacles we're up against, it's hard not to feel hopeless. It's all so big and out of my control. Recently, I suspected that my son had been turned down from a private school because of my lesbianism. The rage and powerlessness I felt tore me apart. Really for the first time, I realized what our alternative family could be up against in this society. All my life I've been battling societal oppression and it's never fazed me, but this time they'd gotten to my child. And along with the anger I projected outward, there was also anger I projected inward. "How many other things are my children going to be excluded from because of the choices I've made for my life? How could I expect my children to suffer the oppression our lifestyle brings? How could I be so selfish? Maybe I was wrong to have children after all..." The internalized oppression is even more insidious than the rest, and sometimes harder to resist. To keep my sanity, to hang onto a sense of strength in my life, I keep my battles limited to what I can handle. I know that by myself, I can't change society or its laws. But I can affect the people around me, the people I deal with every day. This is the way I choose to be politically active. So as much as possible, I make myself visible. To other mothers in the park, checkers at the supermarket, to all those who ask, I say, yes, I am a lesbian and these are my children. To companies who write offering life insurance to me and my spouse, I respond, asking if they consider my lesbian lover my spouse. To salesmen who ask for the lady of the house, I say, here we are. By expecting, even demanding, recognition of my lover and children as a family unit, at least I'm making others aware of our existence. And perhaps one day there will be a place for us on the school forms: Mother #1 and Mother #2. Published in "Matrix Women's Newsmagazine" in 1988. Republished in The Marriage and Family Experience in 1989.